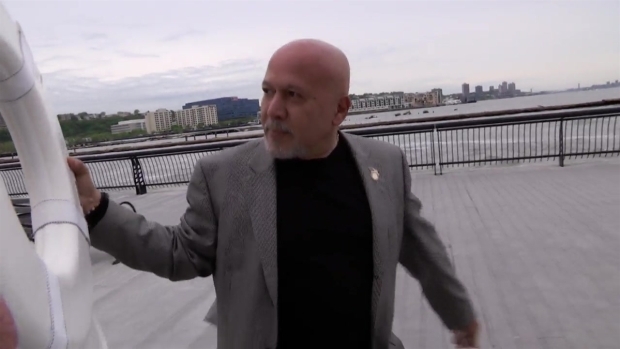 Embattled Paterson Mayor Jose "Joey" Torres held a life preserver over his head and declined to take questions about a legal defense fundraiser he was hosting on a large rented yacht. When asked, "Sir do you know how many people will be attending?” the indicted mayor raised the life preserver in front of his face and waved it at the camera and the reporter who was trying to ask questions. Torres was indicted in March for allegedly stealing from taxpayers. Prosecutors said he ordered city Department of Public Works employees to do construction at a relative’s would-be beer store on city time. The mayor and three DPW supervisors charged in the case all deny wrongdoing. Guests arriving for the yacht party last Thursday told NBC 4 New York they paid $150 to $250 per ticket to attend. The yacht -- the “Cornucopia Majesty” -- is 30,000 square feet, three stories tall and can hold up to 1,200 people. 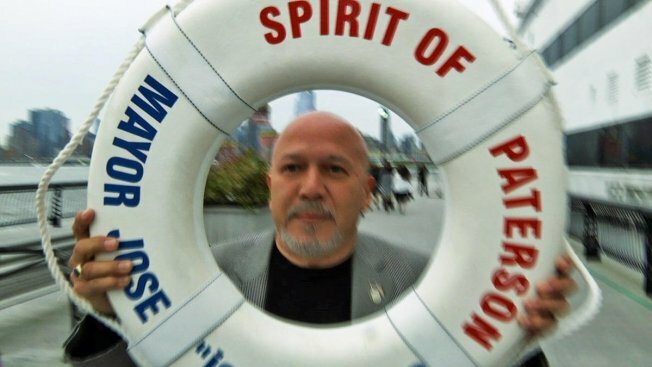 Paterson Mayor Jose Torres, who's facing charges in a corruption probe, had a bizarre, silent response when asked about a legal defense fundraiser he was hosting on a large rented yacht. Watch the whole thing here. The yacht company said it takes a $2,900 down payment plus a minimum of 200 guests billed at about $118 per person -– before liquor and entertainment -- to rent the vessel. That comes to a rental fee of about $26,000 before any additional funds can go into the mayor’s legal defense fund. Torres declined to say how much money was raised or provide any specifics on how and where the money will be spent. Experts said political fundraising does require full disclosure under New Jersey law. But they said details on a legal defense fundraiser can be withheld. Democratic Assemblyman John Wisniewski, who is a candidate for governor, said the disclosure rules for legal defense funds in the state must change. "It raises the implications of who is giving the money and what are they getting for it in return,” Wisniewski said. “I believe disclosure should be the rule and currently it is not." While Torres declined to comment as he walked the dock to the party boat, doling out hugs and handshakes, guests suggested the money was going to help the mayor keep from drowning in legal fees. “You hope your friends never have a problem but when they do they find out whether or not you are a friend,” said Pat Kramer, who said he has been friends with Torres for years. “I think he is innocent and that is why we are here to support him,” said one woman who declined to give her name, adding the business she works for bought a block of tickets. Some other guests identified themselves as city police officers. Paterson business administrator Nellie Pou declined to answer questions as she walked to the ship’s plank except to say, "I am glad to be here." Councilwoman Maritza Davila attended, saying, "I was invited as a guest -- not by the mayor -- and I came."